Everyone knows lasers are cool. But what about an industrial cutter created with the help of a laser? Excelta's Lazer Line™ cutters are made with laser technology and advanced CNC machining to achieve their finest grade premium quality. Built with U.S.-made ball-bearing steel and laser cut for consistency, Excelta's Lazer Line cutters are also created to be extremely durable through induction hardening (to 64 - 65 RHC). These impressive cutters are perfect for use in the electronics and bio-medical industries. Earning Excelta's 5-Star rating (their finest premium cutter), the Lazer Line cutters are available in various lengths, cutting capacities, and head shapes (Medium Round Head Cutters, Medium Round/Relieved Head Cutters, Medium Tapered Head Cutters, Medium Tapered/Relieved Head Cutters). Each cutter also features Excelta's super-duty stainless steel leaf springs. QSource.com features a fine selection of Excelta's ESD-safe Lazer Line cutters. Place your order online through our Web site. Or, you can give us a call (800-966-6020) or send us an email for further information. 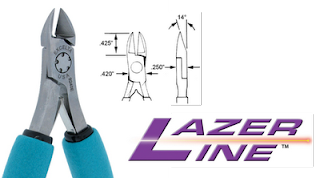 Our expert staff will help you select the right Lazer Line cutter for your application.